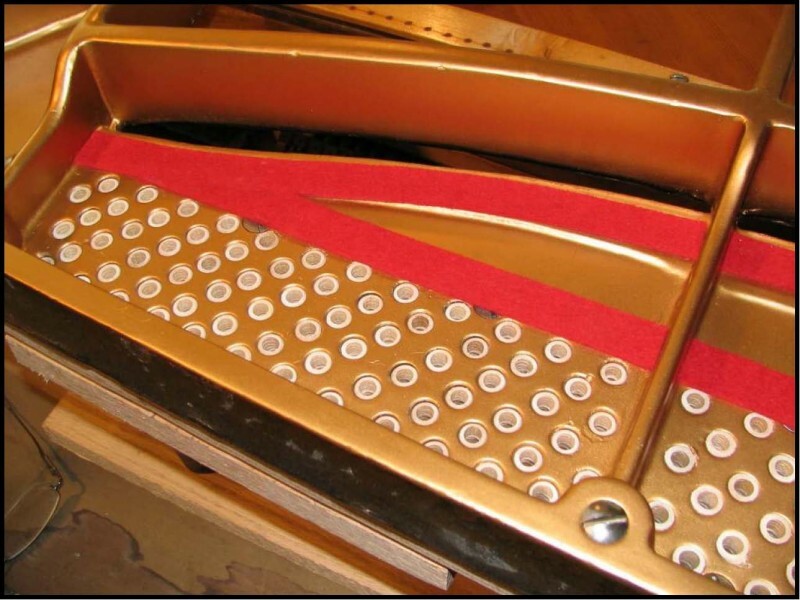 For a piano to maintain a stable tuning, the piano’s pinblock must hold the tuning pins with a viselike grip. If the pinblock has lost its ability to hold tuning pins effectively, steps must be taken to correct the problem if the piano is to stay in tune for a reasonable amount of time. 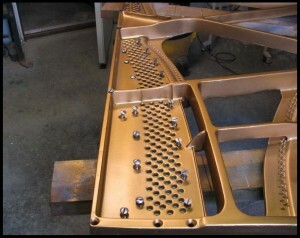 In some cases repinning the piano with oversize pins or treating the pinblock with CA glue or other pinblock restorative may produce adequate results. Often times, however, the best procedure for a pinblock showing signs of deterioration is replacement of the old pinblock with a new customfitted pinblock. The pinblock of your piano has deteriorated to the point where replacement would be the best option. Is the pinblock basically just a block of wood, or is it something special? The pinblock is constructed of selected laminations of hardrock maple, beech or other suitable hardwood stock. To avoid splitting when the 2 1/2 inch tuning pins are driven in, the grain of the laminations runs in opposing directions. Pinblock material is cured to an exacting moisture content and is available in thickness ranging from 1 1/4 inch to 2 inches or more. 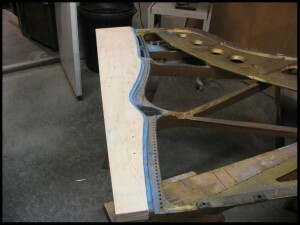 It is available to the rebuilder in blanks which are then cut to size and fitted to the piano in the rebuilding shop. 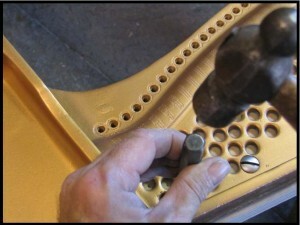 Careful cutting, fitting and drilling of the pinblock to fit your piano exactly makes the process very laborintensive. The end result is a customshaped pinblock which matches in every dimension the pinblock originally installed at the factory (see cover photo). When exactly does a pinblock reach the point where replacement would be the best option? 1. 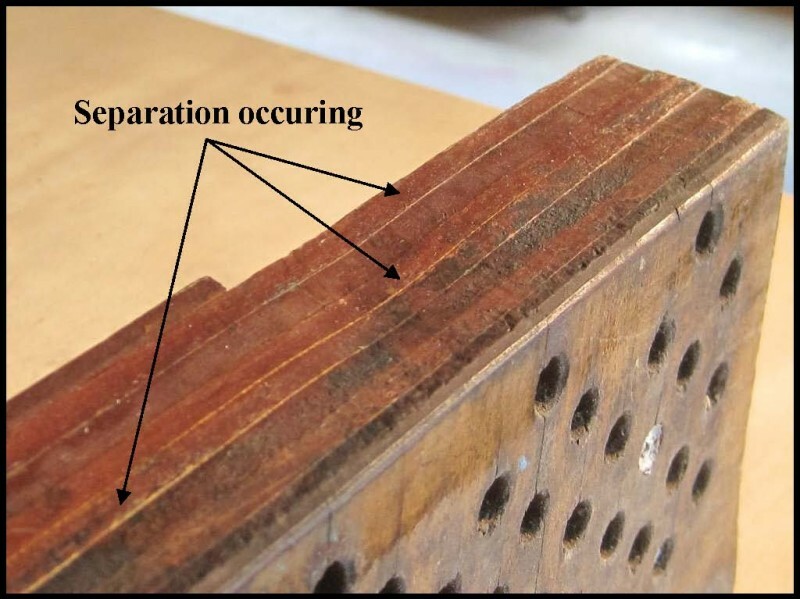 When the laminations have begun to separate, as seen in the pinblock shown above, it’s time for replacement. 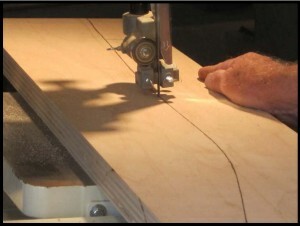 Looseness between the laminations indicate failure of the glue joints, and loss of the integrity of the block. 2. Pinblocks which have been repinned in the past with oversized pins that have now in turn become loose. Any further treatment (such as radically oversized pins) would only provide a temporary fix to the problem of loose pins— sooner or later the pinblock would fail again. 3. Pinblocks that have been treated in the past with a pinblock restorative of the type that soaks in and swells the wood. With such a treatment the cells of the wood crush up against the steel tuning pins, eventually resulting in a mushy, hardtocontrol feel to the pins during tuning. 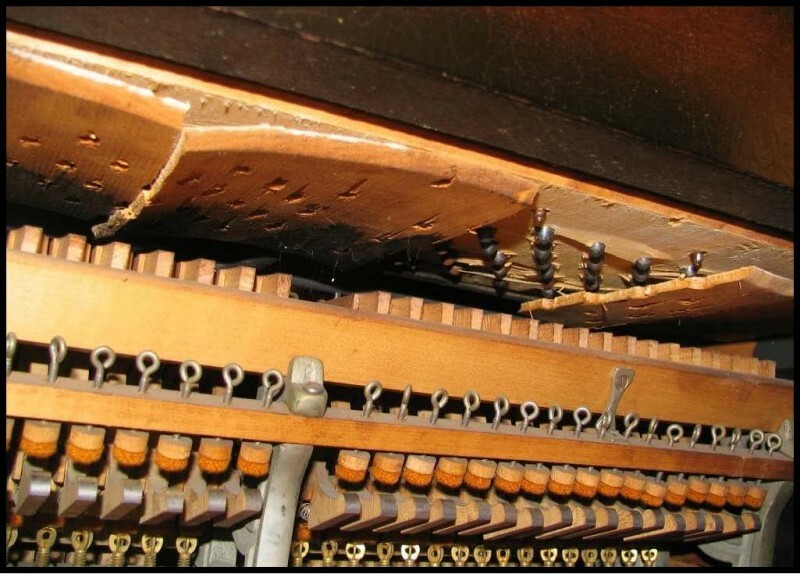 Although these conditions are clearcut situations where pinblock replacement would be the repair of choice, any time the piano is in the workshop for major work such as refinishing or repinning and restringing would be a good time to consider pinblock replacement. Once done, the new pinblock should be good for the foreseeable future, making a return trip to the workshop down the road less likely. Is this a repair that may be done in the home, or does it require the piano be shipped to the workshop? The amount of work involved in replacing the pinblock (and by necessity the pins and strings) would make it impractical to carry out the procedure in the home. 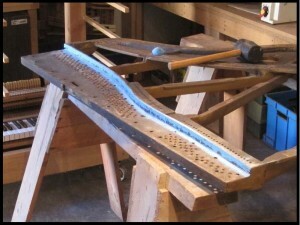 In order to access the pinblock not only do the tuning pins and strings need to be removed, but the cast iron plate must be carefully lifted from the piano (above photo). Only when the plate is out of the instrument may the pinblock be removed for duplication. Replacement of the pinblock requires exceedingly careful measurements to ensure that the cutting, fitting and drilling of the pinblock results in a perfect match of the new pinblock to the piano. 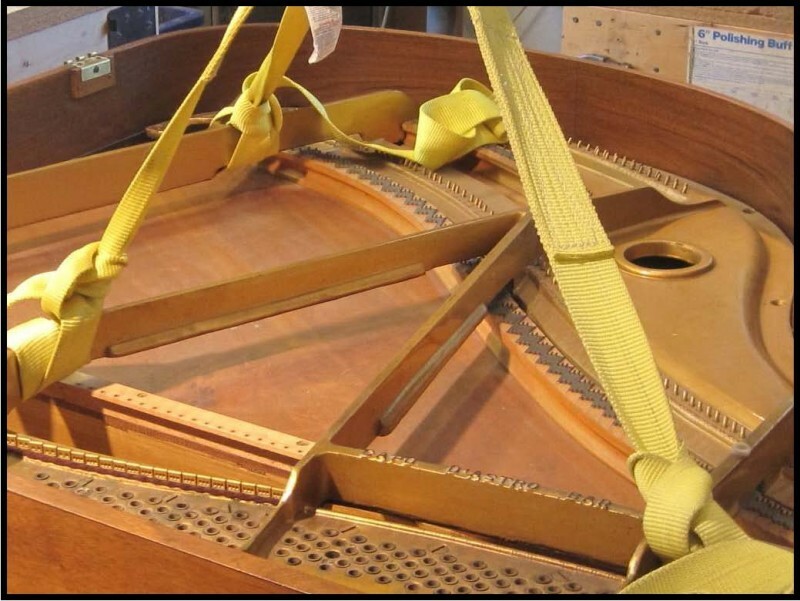 A precision fit is essential for the tuning stability of the piano once the repairs are finished and the piano is returned to its home. Just how exacting is the cutting, fitting and drilling process? Very. Using the old pinblock as a pattern, the new block is cut from a blank of pinblock material of the correct thickness on the bandsaw. The cast iron plate has a solid flange which the pinblock is butted up against. The angle of the cut on the bandsaw is set to match the angle of the flange to the plate. With the plate turned upside down on sawhorses, the flange is chalked for fitting. 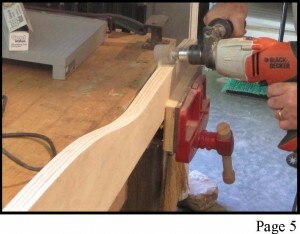 The pinblock is then placed in position and struck with a mallet to show where the high spots are. Obviously, the more care that was taken in the sawing procedure to match the profile of the flange, the less work will be needed at this stage of the job. Each time the block is marked with chalk for high spots, it is removed and secured in a vise. The chalked marks are ground down to eliminate the high spots. This process is repeated again and again until a close fit of the block to the plate with no discernable gaps has be accomplished. 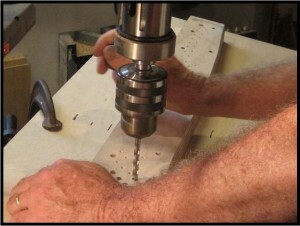 With the pin holes drilled, the pinblock is returned to the plate to be screwed down for good. A big advantage of a new pinblock is that new factorysize pins (usually .282″ diameter) may be installed instead of oversized pins. This is important in terms of ease of tuning. With a new pinblock in place, your piano should hold a stable tuning for years to come. The new pinblock installed, ready for fresh tuning pins and strings.